Four years ago, 34-year-old, Chandra Webb left St. Louis, Missouri, for a job in Jackson, Mississippi teaching health and physical education to junior high school students.Â She rented a two bedroom apartment, and resided there for about three years. Her 74-year-old father, Hezekiah Webb, a retired State Farm agent who lives with his wife in O’Fallon, Illinois, was interested in helping his daughter create financial security. He knew that would be a challenge on Chandra’s teacher salary, which is $37,000 a year. “I wanted her to have something more secure than an apartment. I wanted her to have a house with a garage,â€ says Hezekiah. “I also wanted to figure out how I could help her stabilize her finances,â€ he adds. Hezekiah read an article on how some people were financing homes for their children through financial vehicles called intrafamily mortgages, and decided that he wanted to do this for his daughter. Intrafamily mortgages work exactly like traditional mortgages. There is a borrower, in this case Chandra, and a third party institution that structures and manages the loan, as well as collects monthly payments. In addition, there is the lender, a family member, instead of a bank or financial institution like traditional mortgages. According to a national survey commissioned by Better Homes and Gardens Real Estate, more than two-thirds of all baby boomers said they want to provide future financial support for their children or grandchildren to purchase a home, like these mortgages allow them to do. Chandra has now lived in her dream house for about a year. The 1800-square-foot home cost $200,000 and has a two car garage and three bedrooms. She and her father decided the best way to structure her mortgage was over a nine-year period, at a rate of 1.46%.Â Hezekiah and his wife also each gifted Chandra $14,000, which is the maximum allowed under the IRS tax code. 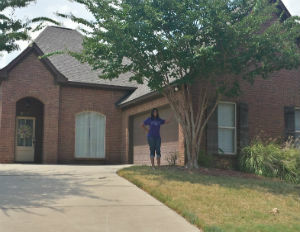 This gave Chandra a down payment of $28,000, making her monthly mortgage payment $182.50. Hezekiah, who earned about $85,000 at the peak of his career as a State Farm agent, was able to put up the remaining mortgage balance in cash, due to a lifetime of careful financial planning. “When I was 21, I set my first financial goal, which was to save $100,000 by the time I was 35. I met that goal when I was 35 and continued to save, invest, and build my wealth through stocks and real estate. By the time I retired, I had close to $4 million,â€ says Hezekiah.